Is a very tall mountain in the middle of a desert hot and dry? Climate is not my priority because I prefer to develop the culture and the languages. However, climate has a strong influence in the culture, so I need to know the basics. So, I have a country located between the equator and the 20° parallel. According to what I have been reading on internet, that means that it's a desert. However, in this country there's a huge mountain range and I don't know how this affects its climate. I suppose that the mountain will be cold, but I don't know how cold and how does snow "work" in this case. I'm interested in the red circle, but specially in the red dot which will most probably be the capital city of the country. Assume an Earth-like planet (and please don't mind the river physics, I still have to edit things). If you need me to give more details, just ask. Mount Kilimanjaro is just about on the equator, and yet is snow-covered. That's because temperature drops as altitude increases. Also, "located between the equator and the 20° parallel. According to what I have been reading on internet, that means that it's a desert" is spectacularly wrong: the Amazon rainforest is also near the equator, but is as far from "desert" as you can get. EDIT: Vietnam, Papua New Guniea, Burma, Thailand, the Philippines, etc, etc are also around the equator. Everything that has a mountain between it and the ocean is super dry and the area right in front of the mountain is super wet. That's what mountains do to climate. So you have several options. A lot depends here - where are the ocean currents and prevailing winds coming from? When using this information, please note that ocean currents can change cyclically - google El Nino for a real-life example. This means that it's possible that the area that's normally wet can sometimes be dry and vice-versa. Now let's talk temperature. According to this reasonable-seeming website, you drop 4 degrees Fahrenhiet for every 1,000 feet, which means that mountains that are ~14,000 feet or higher are probably snow-covered year-round. Bonus points: If you go to their link, they've got a cool little graphic showing different vegetation groups for various altitudes. Tl;Dr - because your mountain only will block East-west winds, you can freely choose what climate both sides will have, and any mountain over ~13,500 feet can expect to have snow. Also, this can be something that changes cyclically over time. That says 9000m, that's a little taller than Everest. Earth only has 14 mountains higher than 8000m, and more than half of them are in Nepal. That mountain will be deadly cold, all year long. The air will be so thin normal people will suffocate. It will hardly ever snow because any moist air that approaches the mountain will tend to drop its moisture before it reaches the top. The mountain will still be covered in a thick layer of snow and many glaciers because the little snow that does fall there never melts. 4000m (where your city is) is still very high. The list of cities above that altitude is short. It's high enough that some visitors from the coast will sick, and they will get winded easily. You can expect harsh winters and short growing seasons. In particular, I would direct you to Cerro de Pasco in Peru, it is the located at 10 degrees south of the equator and is the highest city of that size. The wikipedia page conveniently has a simple summary of the city's climate. I am now going to link you to Palm Springs, CA. A town that features both 100°F daytime temperatures (yes, even during the winter, although typically a more comfortable 70–80) and is classed as a hot desert climate. Nights can get pretty cold, though, which is typical for a dry desert. Twelve minutes away, up a tram into the adjoining mountains, with nearly 6000 feet of additional elevation, you'll find snow during the day. Or at least, temperatures 40 degrees cooler than down at the bottom (bring a jacket). Snow only falls during the winter as the mountains do get warm enough during the summer for it to melt, but the temperature gradient is staggering and as such has become quite the tourist hot-spot. So no, a mountain in a desert is not always hot and dry. Not the answer you're looking for? Browse other questions tagged climate or ask your own question. How would a large arctic mountain range affect the weather? Single biome (hot) desert planet, possible? What if half the Earth was covered in lava? Would a temperate “land of the midnight sun” be habitable? 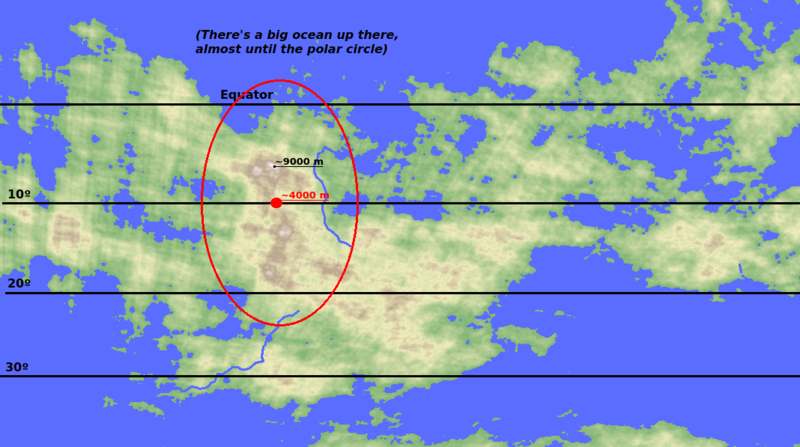 What would the climate on a planet with 85% or more of the surface area covered in water be like? What happens to plants when the temperature increases a lot in a couple of years?